First, you upgrade your PC. Then, you fire up all the games that used to give your PC a hard time and obliterate them. It's a time-honored tradition, and the only thing that changes from year to year and GPU to GPU is which games you choose. Which games do you bring before your towering new rig? Which games do you lay on the altar of VRAM and CUDA cores, cranking up texture detail while maniacally watching the counter in the corner of the screen? Everyone does this a little differently. Today, I thought I'd share the first five games I play on a new or newly upgraded gaming PC. 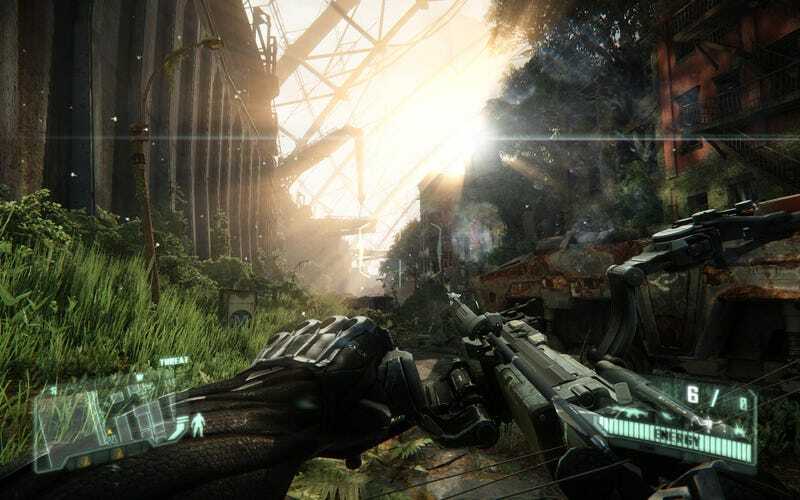 It stands to reason that at some point, Crysis 3 will be dated enough that we'll stop using it to benchmark new PCs. That day has not yet arrived. Crysis 3 is the main reason I even bother to install Origin on a new PC. I just need to see how good the dude-faces will look at an even higher detail setting, and an even higher resolution. Can a dude's face look so real it bends space and time? Eventually, Crysis 3 will show us the answer. I haven't had much time for Frontier's Elite: Dangerous lately, but when I play, I've been experimenting with getting out of my Oculus Rift holodeck and playing it on a monitor like a normal human being. That's where the game's beautiful visuals really shine, and where it becomes an ideal testing ground for new hardware. With all the light flares, atmospheric detail, and textures cranked up, this game can look amazing. It can also be pretty taxing on my PC. The question of "How smoothly can this computer run Divinity: Original Sin?" didn't initially strike me as a one that I'd be asking all that frequently. But this game is a real looker, especially at high resolutions—everything looks like a tiny, well-lit diorama that just happens to explode from time to time. The Metro games remain early go-tos for me for when I've upgraded my PC. For games that take place mostly in the dark, they're unusually beautiful, thanks both to strong art direction and some high fidelity visuals. These games used to pulverize my old computers, to the point that it's still satisfying to watch my newer PCs muscle them into line. I don't know why I like to throw my PCs up against Far Cry 4. It had enough issues in the early goings that it appears to be a somewhat crusty port, and it's hard to say whether any graphical slowdown I may encounter is actually the result of slow hardware of if it's simply due to weird software. Regardless, Far Cry 3 was one of my go-to games for testing new hardware, and nowadays, Far Cry 4 has taken its place. Look, I just want to hop on an ATV and ramp off a mountain with dropping a single frame. Is that so much to ask? Those are my five, though of course there are a few others, too. What are yours?